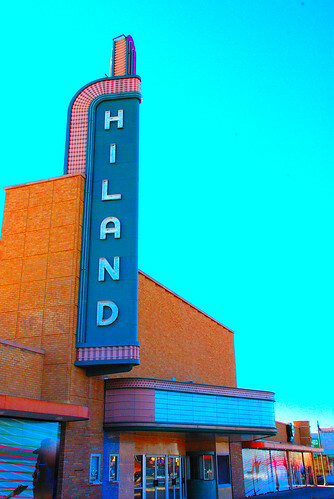 The Hiland Theater was opened on April 20, 1950. Seating inside the auditorium was provided for 1,188 on a stadium plan, with a raised stepped section at the rear. There was a car park at the rear of the building which held 350 cars. It closed as a movie theatre in the summer of 1995, and has now become a venue for live theater. A 1973 photo of Hiland Theater in Albuquerque. As of Jan 19, 2009 – the State Board of Finance as voted to lease the Hiland Theater to the National Dance Institute of New Mexico. NDI will be responsible for the renovation of the theater at an estimated cost of $9 million. The theater has been closed since 2004 when Musical Theater Southwest moved to their current home. The April 15, 1950, issue of Boxoffice Magazine said that the J.T. Boutwell Company had installed 1,172 Kroelher seats in the Hiland Theatre, Albuquerque. The November 27, 1967, issue of Boxoffice ran an article about Blanche Hatton, who had been managing theaters in Albuquerque since her arrival there in 1924. She became the first manager of the newly-opened Hiland in 1950, and held that post until 1963. What a horrible movie to be playing at such a classy looking theatre.1983 photos. My grandfather was J.T. Boutwell, let me know how those seats are doing. A photo I took back in 2008 of the Hiland Theatre..
April 20th, 1950 grand opening ad in photo section. Typical Interstate Theatres design. A nice venue. I saw Robert Redford speak and receive an honor there in 2013.